Now more than ever before, after the passing of a loved one, families are requesting donations to a favorite charity be made in lieu of flowers. This very kind gesture enhances our ability to conserve the conservation and historic assets of ’Sconset and provide access to these beautiful places. Please be sure to tell us in whose memory you are making a donation, and provide both your address and an address so that we may properly acknowledge your thoughtfulness to surviving family or friends. Donate online now! Make a gift in honor or appreciation of someone special in your life, someone who has accomplished a goal or perhaps to celebrate a birthday or anniversary. When honoring someone with a gift to the Trust, be sure to tell us their name and address in the space provided so that we may send the honoree a special acknowledgement of your thoughtfulness. We will also send you, the donor, a receipt for tax purposes.Donate online now! 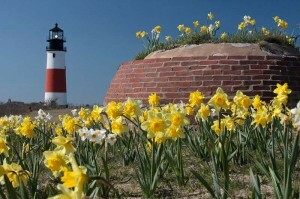 In 2010, the Trust introduced a daffodil planting program at the Sankaty Head Lighthouse property. Daffodils may be given in memory or honor of individuals or organizations. Please contact the Trust office for more details. Memorial donations and honorary gifts are tax-deductible. A card will be sent to the family or individual acknowledging your thoughtfulness but not including the amount of your gift. As a donor, you will receive a separate acknowledgement of your charitable donation for your records.